Prince William, Duke of Cambridge, with members of the Vodafone Flying Fijians team yesterday. Prince William, the Duke of Cambridge, visited the Vodafone Flying Fijians following their 13-23 defeat against Wales yesterday. 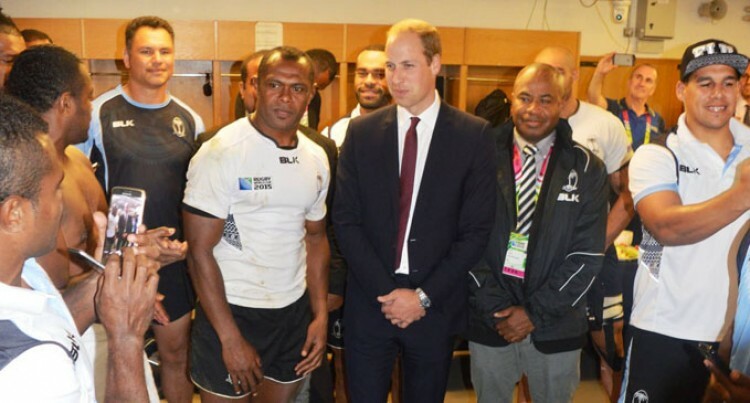 Prince William, who is also the vice-patron of the Wales Rugby Union, lit up the Fijians’ changing room with his visit and the players also had photo opportunities with the Prince. The Duke of Cambridge acknowledged the head coach John McKee and the players for their great effort against his Welsh team. “Thank you for a great game of rugby and for the physical effort that you had put into the game. “I wish you well for your last pool match against Uruguay,” Prince William told the team. The John McKee-coached side then acknowledged Prince William for his visit in their changing room. The player’s efforts were also commended by Fiji’s Prime Minister Voreqe Bainimarama who stopped over in Wales to watch the Flying Fijians’ crucial match. Bainimarama was returning from the 70the Session of the United Nations General Assembly in New York. “On behalf of the people back home I thank you for a great game. Now you have to look forward to your next match against Uruguay,” he said. The PM then walked around the changing room shaking hands and reminding players of their last match. Sevens Maestro Waisale Serevi also praised the team on Facebook from his home in Seattle, Washington yesterday. “Phil 4:13, Vinaka vakalevu ra cauravou na qito, totoka vakaoti na qito (thank you boys for the great game). You all are still a credit to our country and we still love you guys no matter the results.